This post is meant as an introduction to the Tri-ang range of large-scale pressed steel lorries which were produced from the early 1930′s through to the demise of Tri-ang in the mid-1970′s. Please be aware that dates given for the vehice ranges are approximate and intended only as a guide. During this time frame nine different ranges of lorry were produced along with trains and cranes although it should be mentioned that up to the mid 1950′s most of the trains produced were made from wood and between 1957 and 1970 Tri-ang brought out their iconic pressed steel buses which I may well return to at a later date. 1930 – 1937 saw Tri-angs first metal lorries range being produced, these were an open cab type vehicle with a long bonnet, radiators were either silver or black with thin metal wheels fitted with thin rubber tyres. Best described as a toy and not a model, relatively crude and nieve in their design and manufacture yet having said all that are today seen by many as being full of charm and character. 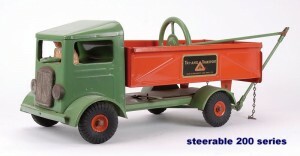 This first early series of metal lorries included a tipper truck, milk lorry and breakdown truck together with the timber lorry pictured above. 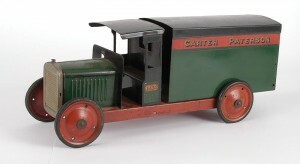 To compliment the lorries a series of box vans in different liveries was also produced which included amongst others the Carter Paterson van shown opposite. 1937 – 1956 saw the arrival of the Bedford range of Tri-ang pressed steel lorries, so called as they were made to resemble the Bedford trucks of the day. 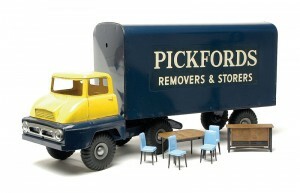 The range of vehicles produced was similar to the previous metal lorries range but now featured an enclosed cab and came complete with a load where appropriate. The ‘Bedfords’ could have any of three different radiator grills fitted, a standard unpainted one or ones painted in either cream or black. As a rough rule of thumb the pre-war models came with thin metal disc wheels and tyres which were replaced post war with thick rubber tyres but as always there was some overlap as there were some Tri-ang vehicles produced even in 1950 with metal disc wheels. By far an easier way of identifying a pre-war Bedford series is to check the underside of its chassis. Pre-war this would be constructed using a single sheet of steel whereas post war versions would see the chassis having circular and/or rectangular sections cut out of it in order to save metal. Tyres on the Bedford series of lorries were always 7cm dia. except on the breakdown lorry where the diameter was increased to 9cm. (3.5″). 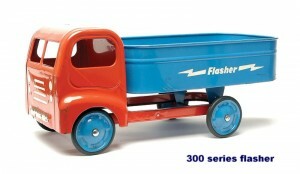 1948 – 1957 saw Tri-ang bring out their third series of pressed steel lorries known as the ’200′ series. In this series the lorries adopted the new square shaped forward control type cab. Initially three models, two tipping/builders lorries and a transport van made up the series with a petrol tanker and mobile crane being added later. 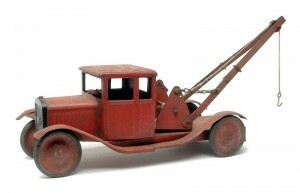 Of the two tipping lorries one was manufactured with ‘remote control’ steering, this had a raised steering wheel at the rear and steered the front wheels via a universal coupling. 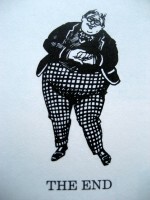 1955 – 1960 brought about Tri-ang’s ‘Diesel’ series. This Tri-ang series although smaller than the 200 series carried a much larger range of vehicles. 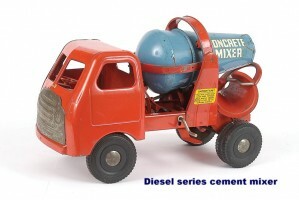 Initially the series began with just two lorries, the first was the usual tipper lorry but the second was a much more unusual working cement mixer lorry which had a drum which was linked to the lorry axle and thus revolved as the lorry moved forwards. 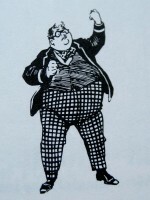 The drum could also be tipped to allow its load to be emptied through a rear trough just as on an actual cement mixer. These lorries were in turn followed by the Express Delivery Lorry, a Breakdown Services lorry which had a working crane jib fitted with hoist along with a toolbox with tools. 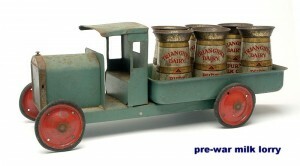 The range also included a Farm lorry complete with its load of plastic pigs, a Milk wagon with milk churns, a Petrol Tanker with ‘Shell’ logo to tank sides and rear and a Fire Engine complete with bell, rotating and extending ladder, fireman and working hose. The Diesel series also included several six-wheeled which included amongst others Military lorries and a Side-Tipping Ballast Truck. Around 1957 Triang also added several articulated lorries into the Diesel range which included a low loader with excavator and a car transporter. 1957 – 1963, as Triang lauched its articulated lorries in the Diesel series it dropped the ’200′ series lorries and launched a new ’300′ series (Still with me ?). Gone were the square cab shaped 200′s to be replaced by a more rounded cab, similar to the Diesel in some respects but now with front protruding wheel arches which reflected a more modern ’50′s styling. The ’300′ series carried the same body styles to that of the ’200′ series but added to the range was now a mobile cafeteria van with side opening canopies and came complete with various plastic items including a jug and drinking glasses ! 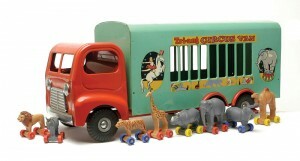 Later models included a horse transporter which came with two wooden horses, later changed to plastic and several six-wheel vehicles amongst which was a circus van together with various animals and a long distance transport van. 1959 – 1966 saw Tri-ang attempting to keep pace with the changing face of road transport of the day with a range of commercial vehicles which mirrored their modern day counterparts thus the Thames Trader range was launched. 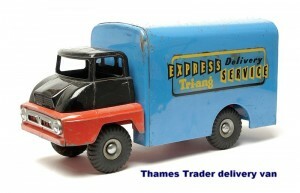 Fifteen vehicles made up the Thames Trader range and included all the old favourites such as the tipper lorry, farm truck, milk lorry, delivery van, fire engine, breakdown lorry etc.etc. Also included in the range were several articulated lorries, the car transporter, low loader, rocket transporter, removals van, flat truck, open truck and petrol tanker. Interestingly Tri-ang also added working headlights into some models which used small torch bulbs powered by batteries housed underneath the chassis and operated by a simple push-in switch located on the side of the chassis behind the cab. 1958 – 1967 was the time frame for Tri-ang’s Junior Series, launched with just seven commercial vehicles making up the range they always remind me of the big American trucks of the ’60′s with their high cabs and large radiator grills. The initial seven comprised the farm truck, tip lorry, petrol tanker, milk lorry, delivery van, open back truck and a breakdown lorry. 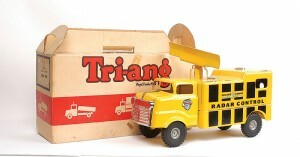 All seven carried a header board sited on top of the cab with the Tri-ang name prominant. A host of other commercials were added to the series over time including some more unusual ones such as the army transport van with canvas tilt, a similar raf van, a police van, mobile shop van, musical ice cream van, a radar control truck and an airport crash tender. All in all over twenty different lorries were to make up the Junior series. The smaller Junior Series / The medium Thames Trader Series / The larger ’300′ Series. 1962 – 1966 saw Tri-ang update the tiring ’300′ series with the addition of plastic bumpers and lights, side mirrors, air horns, plastic windows and windscreen wipers all under the Regal Roadster series banner. 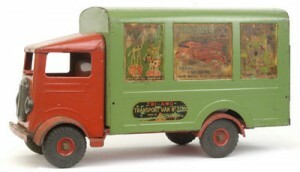 Colours were now in metallic paint rather than the usual red, blue and turquoise enamels and the vehicles now had grey plastic wheels and for novelty value a ‘clicker’ mechanism was fitted to the front axle of the commercial which made a noise as the lorry was pushed along. All three of the Tri-ang commercial vehicle ranges that is the Junior, Thames Trader and Regal Roadster series all met their end at about the same time. 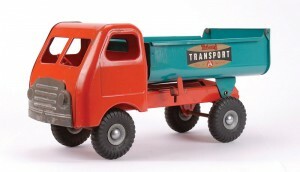 Around 1966 they were dropped for a new Tri-ang range of vehicles which was the Hi-Way series and branded as ‘modern trucks for modern children’. 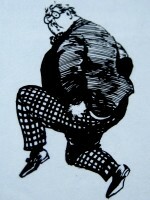 This series would continue through to the demise of Tri-ang in 1973. This Hi-Way series was perhaps the worse that Tri-ang put out, garish in its looks and lacking in appeal the trucks were smaller than even the Junior commercials and comprised more plastic in their make-up yet gone were the plastic extras that proved so popular on the Regal Roadsters. A sad end to a once mighty toy maker. Unless you stumbled upon this site by accident or have landed on planet Earth, perhaps again by accident, then I am sure there is no need for me to introduce Dinky Toys to you. Practially everyone in Gt.Britain and indeed around the world knows of them and what’s more the words ‘Dinky Toys’ tends to be used nowadays by many people when referring to a small diecast car regardless of the manufacturer. 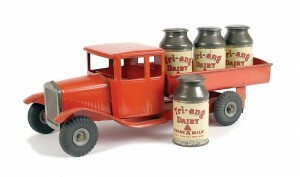 Indeed its not that long ago that I spent one Sunday morning driving many a mile in order to buy some, what I was assured were Dinky Toys, only to find that when I got there I was confronted by a dining table full of Lledo vehicles ! – You just have to laugh, well only till you get back to the car, then you can say what you actually feel between gritted teeth !! So we are all clear what a Dinky Toy is right, but how many of us have given a second thought as to how the model is actually produced. 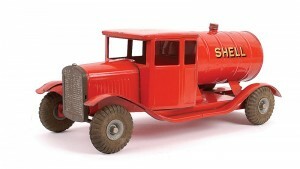 In these days when you can just about build your own Dinky model from start to finish, including the box, out of a selection of brand new parts all available on the internet I thought I might take time out to run through how the Dinky Toy was produced back in the good old days of the 1940′s-50′s at the Meccano Works, Binns Road, Liverpool. It should be noted at this point that what follows is a laymans guide only and names and dates may have been changed to protect the innocent. A Dinky Toy is a diecast metal model which means that they are made by forcing molten metal into a mould or ‘die’ that gives the metal the required shape when it cools and solidifies. Sounds simple but as we all know its not going to be that simple – to begin with the die itself must be made with the utmost accuracy in order to produce an item of exactly the right dimensions. Also the actual design of the die is imperitive, as an ex-draughtsman in an earlier life I feel I should add extra emphasis at this point and say that the design element is crucial to the sucess of the project ! Generally the die may be of two main sections which when fitted together leave enough of a space for the molten metal to fill. That is all well and good if the part to be cast is of a basic shape when the die can be seperated and the casting required removed but becomes another story when the part being produced is subject to recesses or undercuts. (look at any Dinky lorry for reference at this point where the cab and chassis form one casting). When this is the case our hero draughtsman comes to our aid and modifies the design such that one of its two sections will now have further parts within it which will slide out sideways so as to allow the casting to be ejected from the mould. (pause for a fanfare of trumpets for the drawing office !). Having produced the metal die the two sections are mounted in a Die-Casting machine. One section is bolted to the fixed platen of the machine the other is mounted onto a moving platen. It is this moving platen which when located in its final position closes the two halves of the die and allows casting to take place when a plunger, operated by compressed air, forces molten metal from a cylinder into the die where it fills the space left between the two sections. The metal solidifies almost immediately chilled by the metal of the die itself which in turn is constantly cooled by water flowing through openings bored through it. Each die-cast machine is linked to a cast iron ‘pot’ that holds the molten metal from which the Dinky Toys are cast. Each ‘pot’ is heated by pressure gas flames, blue like those of a bunsen burner – do they still have bunsen burners in the chemistry lab ? 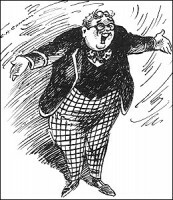 – probably not allowed under Health & Safety legislation these sad days - how many times would someone turn on the gas tap in the middle of a lesson before another boy would shout ‘Sir, Sir, Please Sir I can smell gas !’ whereupon another idiot would appear to konk out. In the end it was felt best all round to have the bunsen burners constantly alight to avoid repititions of ‘I can smell gas’. This soon was replaced by ‘Sir, Sir, Please Sir someones set my homework on fire !’ whereupon another idiot would drop the burning exercise book in the sink and turn on the water tap. How on earth I got the O-Level without the aid of a safety net I will never know. These gas flames keep the metal molten, the supply is renewed from time to time by placing another ingot of metal into the ‘pot’ which relaces the metal used as the casting process continues. The operation of the die-casting machine is generally controlled by the use of two levers which are interlocked to prevent molten metal being forced through the nozzle when the dies are apart. When the first lever is operated the platen carrying the moving part of the die travels until it is in contact with the die on the fixed platen. At this point the interlock is operated automatically to permit movement of the second lever. This second lever actuates the plunger that forces metal into the mould, the plunger is then raised, the mould is opened and the finished casting is ejected. I say finished casting but it does have attached to it the ‘runner’, this is surplus metal from the opening through which the molten metal entered the die. In part 1 we dealt with actually producing the Dinky toy casting and left it with its ‘runner’ still attached along with a certain amount of excess metal along what corresponded to the joint lines of the mould and is termed the ‘flash’. The runner is easily broken off but the ‘flash’ cannot be removed in this way. The solution is to put the castings through what is termed the ‘Roto-Finishing Process’. In this the castings, along with a quantity of water and small pebbles, are placed in large six-sided steel barrels fitted with rubber linings. As the barels rotate so the pebbles rub on the castings and wear off the ‘flash’. Once the process is complete the water can be drained off through a small mesh filter leaving behind the pebbles and castings. This mixed load of pebbles and castings is then emptied and transferred to the seperation plant. Here by means of a wire grid, too small to allow the castings through but large enough to let the pebbles fall through the seperation takes place. The grid is vibrated rapidly backwards and forwards so the pebbles and castings run along it. By the time the end of the grid is reached the seperation is complete and the castings move onto the next stage whilst the pebbles are returned to the Roto-Finishing barrels to do their job once again. The castings at this stage are smooth and look ready for enamelling but before that can take place they need to undergo a process which will give them protection against corrosion and also lightly etch the surface to provide a key for painting. This process is termed Bonderising. Once more the castings are loaded into six-sided barrels, smaller than those used in the Roto-Finishing process and this time made from stainless steel with perforated sides. These barrels along with their load are carried on an endless chain and are dipped successively into three tanks. The first tank contains the actual bonderising liquid whilst the second and third tanks contain cold and hot water respectively which wash the castings. From here the barrels pass through drying ovens before the castings are emptied onto a conveyor belt for delivery to the next phase in their production. After an inspection process the castings move through to the automatic spraying machines. Here a circular table has around its rim a series of equally spaced pillars carrying holders. The castings are placed on the holders whilst the table rotates in stages. These stages bring each casting in turn into the spraying position where spray guns apply a fine even coat of enamel. At this point the holder and the casting itself rotate rapidly to ensure every bit is covered. As the castings move on with the rotation of the table they are lifted off and placed on trays which are in turn placed on racks for transport through the drying ovens where they reach a temperature of 200 deg.F which not only dries but hardens the coating of enamel. Looking almost there but the spraying machine has only applied the basic colour and many Dinky Toys require a second colour, in many cases is just a case of the radiator grille, headlights or front and rear bumpers, in others its a colour flash to a rear wing but this now requires the use of a hand spray gun. It also involves the use of model ‘masks’ which will allow the application of the second colour, say aluminium for headlights, being applied where it is needed without contaminating other parts of the model. These hand gun stations are located along a conveyor table fitted with miniature spraying booths and the masks used will vary according to the needs of the particular model. Baking follows again to harden the enamel and then the model is ready for final assembly. part 6. 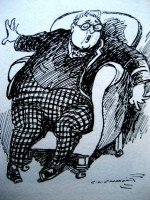 – by jove thats it ! 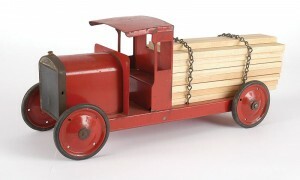 Each Dinky Toy requires its own special assembly methods the majority will however require wheels and axles. The wheels themselves are diecast which are sprayed the necessary colour. Tyres are placed on them and they are fitted on the axles which are produced in the machine shop and are retained by rivet-shaped heads formed on the ends of the axles by means of a specially shaped riveting tool. Baseplates are in almost all instances steel pressings and the necessary preparation for its assembly began back in its die casting where the casting would be made with small projecting spigots that fit into corresponding holes in the baseplate. The body and the base are then fitted together with the spigots projecting through the holes all that is then required is to spread the ends of the spigots to fix the two in position. This is accomplished by using a spinning tool specially shaped to press down and open out the ends of the spigot. Baseplates normally carry the Dinky Toys name as well as the model name and number all of which is embossed on the steel pressing. Your Dinky Toy is now complete, just one final inspection then its off to the packing bay to be placed in the familiar Dinky Toys box which we all know and love. I would like to think that the above post will in some small way make you appreciate even more what goes into the making of a Dinky Toy. I have tried to keep it simple so that even I can understand the process, I have omitted a lot by taking just one period in the Dinky Toys timeline and limited it to the production process. Sadly although I think I mentioned them in passing I have to say with a heavy heart I did not include the beginning of it all – the drawing/design office and the production of a Dinky model on the drawing board. Did I say I was an ex-draughtsman ? 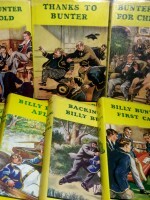 but if I had began there I would probably have got no further. My thanks in the compilation of this tome go in no small part to information I have gleaned from numerous issues of Meccano Magazine and also to my various mechanical engineering technology lecturers (I always knew my H.N.C would come in useful one day).